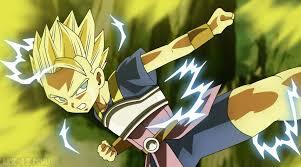 Did Kale ever turn into super saiyan 2? We have no doubts that universe 6 saiyans Caulifla, Kyabe and Kefura turned super saiyan 2. Now the Dragon Ball Wikia arent official sources. Therefore my question is, did Kale ever turned into super saiyan 2 in Dragon Ball Super? In Episode 92 when Cabba tried to teach Caulifla and Kale to go Super Saiyan. We know the Caulifla in her SSJ form was stronger than Cabba and Kale in her out of control Berserker form at that time, was stronger than SSJ Caulifla and Caulifla had to go SSJ2 to block her attack. In Episode 113-114 SSJ2 Caulifla was initially fighting with Goku until Kale Joined in. When Kale Joined in, she was in perfect sync with Caulifla despite her being SSJ2 (Which is 50 times stronger than SSJ). I believe, Kale's SSJ transformation is different from a regular SSJ transformation and makes her slightly stronger than the average SSJ transformation. 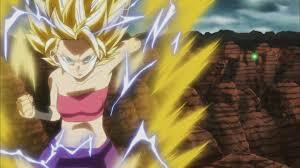 After Kale transformed to her mastered LSSJ transformation, she was completely superior in strength to SSJ2 Caulifla. We know this based on 2 reasons. When Goku first turned SSJG, Kale could hold her own against him while Caulifla was completely overwhelmed. So the Mastered LSSJ transformation makes Kale substantially stronger than SSJ3 Goku considering the fact that SSJG is a lot stronger. 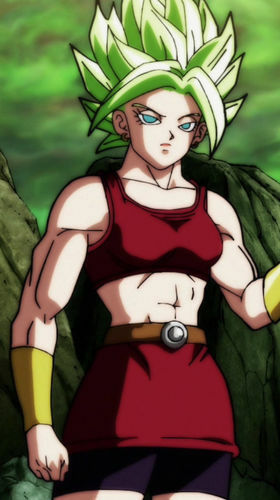 When Kale and Caulifla fused, Base Kefla was strong enough to easily overwhelm SSJG Goku. This again is because of Kale's superiorty in strength. So to answer your question, just like Vegeta skipped the SSJ3 transformation and managed to attain an even higher power, Kale more or less did the same. Another Important Piece of Information: Both Kale and Caulifla are very inexperienced fighters compared to Goku/Vegeta and even Cabba. Also, they aren't aware of God Ki and cannot sense how strong it is. This is why, Kale and Caulifla were more amused by SSJ3 over something like SSJG and SSJB which are a lot stronger. Kale by herself is superior to the SSJ3 transformation based on her fight with SSJG goku and tanking that suppressed SSJB Kamehameha. Is Super Saiyan Rosé Goku Black's version of the Super Saiyan Blue or his version of the original (golden) Super Saiyan? Did Caulifla learn super saiyan and super saiyan 2 in the same day? Are Kale and Caulifla truly sisters or Kale call Caulifla “sister” in an affective way? Do universe 6 saiyans transform more easily than universe 7 saiyans? Is Super Saiyan Green an official name or not? Could Goku, Vegeta or Trunks become super saiyan rosé by becoming a god of destruction or a kaioshin? Does Kale have 2 or 3 transformations already? Does Vegeta new transformation/form has an official name already?